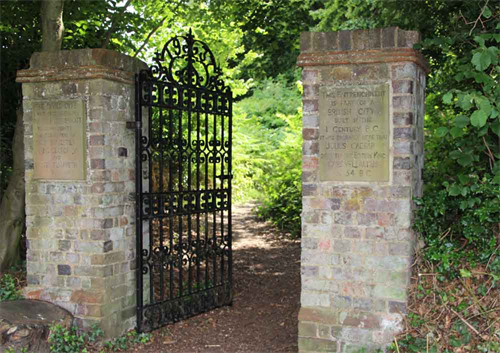 As you enter our village from the east, the sign on Marford Road welcomes visitors to our historic village. It is aptly situated. The road follows the northern boundary of a set of defensive earthworks constructed before the Roman invasion of Britain. The Devil’s Dyke is the most visible evidence of these earthworks. Fifteen metres deep, forty metres wide and 460 metres long, digging the Dyke by hand must have been a considerable challenge for the people who lived here over 2000 years ago. The construction of the ditch and banks would have represented a huge investment in resources, so the need to create a refuge for people and their livestock must have been pressing. The people who lived here were members of the Catuvellauni tribe and this kind of site was called an Oppidum (Roman term for “Main Settlement” in an administrative area). Wisely, they chose the higher land near to the River Lea with the Moat, a spring, providing natural fortification to the south, the Slad, probably a natural ditch, to the east, and the Dyke, which they constructed, to the west. The overall size of this defended site is very impressive: at 110 acres (46 ha. ), it’s the largest site of this kind in Hertfordshire. In these less violent times, a walk through the Dyke is always a pleasure and a reminder of our shared past. The tall trees and steep slopes of the Dyke have long provided a site for childhood dares and adventures: a history themed playground for the children of the village. In May some of the banks are carpeted in bluebells and the shrubs and trees provide places for breeding birds. Look out for the strangely shaped, coppiced hornbeam trees at the northern end, and the magnificent mature beech and ash trees further south. 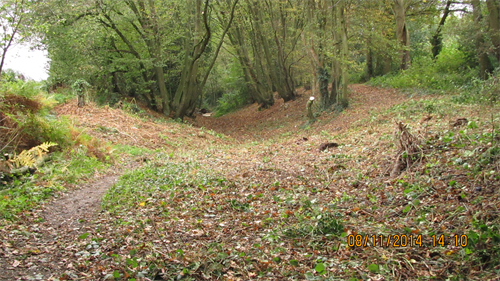 The Dyke is a Scheduled Ancient Monument and works that take place there have to be overseen by English Heritage. Recently, some dead trees, mostly elms that have succumbed to Dutch Elm Disease, have been felled to ensure public safety and to make the area more open and attractive to visit. There are also plans to improve the entrance and boardwalk across a particularly muddy area has been installed. Please note that only the Dyke itself is open for public access. 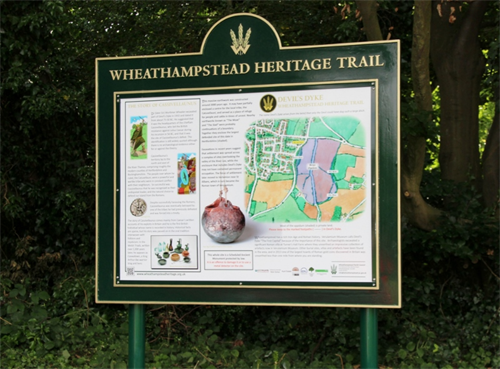 More information on Devil’s Dyke can be found on the Wheathampstead Heritage website.